Review: Valerie Plame is a CIA operative. She discovers that her identity gets leaked by the government. This is payback for an article her husband wrote. The article was criticizing the Bush administration. This film is actually based on real events. 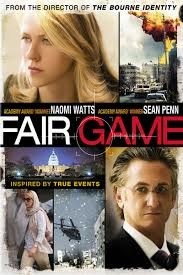 Both Sean Penn and Naomi Watts did a fantastic job of acting in this. Doug Liman has worked on The Bourne franchise and is a fantastic director. The whole of the script was well written. I don’t think that it was that long ago that the story was in the news and to do the film so soon was a brave thing to do.